The Anglo-Saxons knew an excellent location when they saw it, erecting a timber church on the flanks of Ruxley Hill. Later this became the administrative centre for the entire Hundred of Ruxley, a swathe of Kent stretching from Bexley to Biggin Hill. 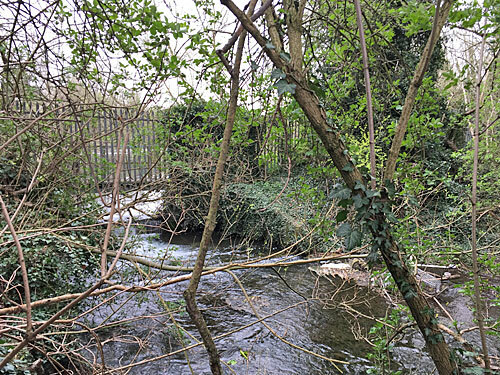 Ruxley's influence has diminished somewhat since those heady medieval days, and the Sidcup bypass now allows passing traffic to give it a miss. But you'd be a fool to skirt Ruxley altogether, thronged as it is with leisure opportunities and cultural gems. 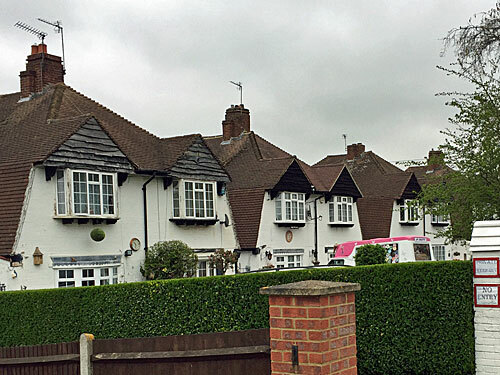 Most visitors arrive in Ruxley at Ruxley Corner, the 5-way roundabout where a rural crossroads once stood. Ruxley is easily approached by car, or indeed thundering lorry, thanks to its convenient location almost on the A20. It's also a great place to buy a car, thanks to showrooms for BMW, Lexus, Toyota and Porsche, not to mention a great place to stop for petrol, courtesy of a BP filling station at each end of the village. 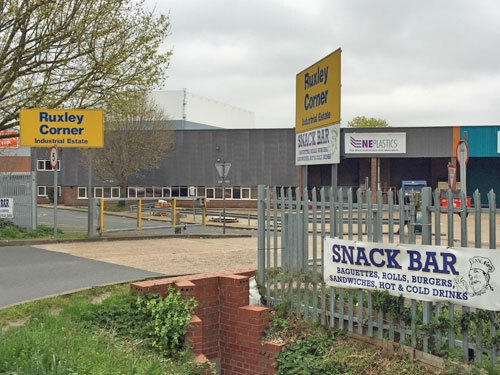 Stop by at Ruxley Corner Industrial Estate and you can't fail to be impressed by the Richard Klinger Factory. This Modernist gem opened in 1938 for the production of valves and compressed fibre gaskets, and was Grade II listed in 1999 shortly before the Austrian owners closed it down. 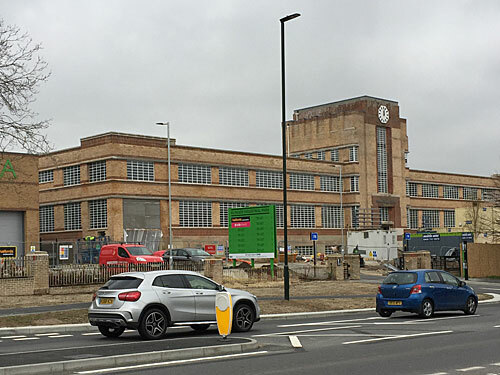 Everything behind the buff brick frontage has now been knocked down and replaced by a big aluminium shed, thankfully ending two decades of decay, and Halfords will be opening in one of the units shortly. Ruxley Lakes officially form south London's largest expanse of open water. This remarkable wildlife oasis was formed by flooding former gravel pits alongside the River Cray, and now provides a rare wetland habitat for waterfowl and over 500 known plant species. Alas the lakes are almost entirely invisible from outside, and jealously guarded by the Orpington & District Angling Association. But if you've not pre-booked with the warden, don't worry, it's relatively easy to shimmy down a roadside verge and spot a dumped shopping trolley in the northern outflow. Also hidden from prying visitors is Ruxley Wood, a large deciduous enclosure covering most of the hilltop (and currently ablaze with fresh green foliage). 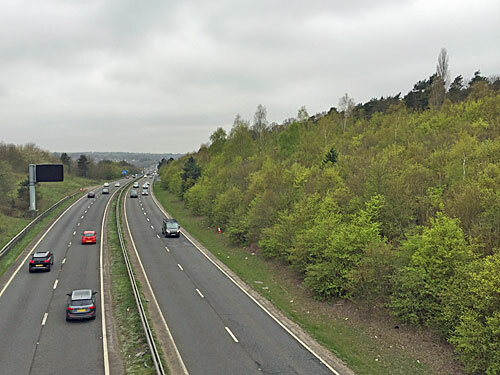 The A20 borders one flank, as previously illustrated, while a run of railings and hastily repaired fencing prevents access from Sandy Lane. 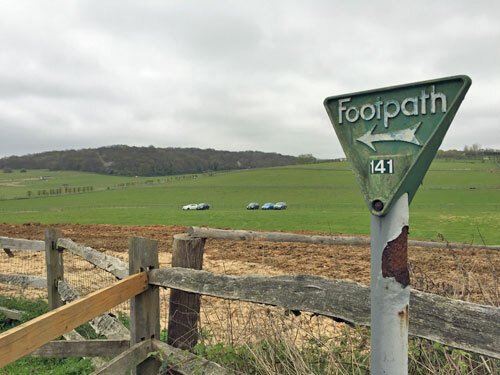 For a tantalising glimpse climb the claustrophobic footpath from Maidstone Road towards the phone mast at the summit, past the sign saying Dangerous Animals Do Not Enter. 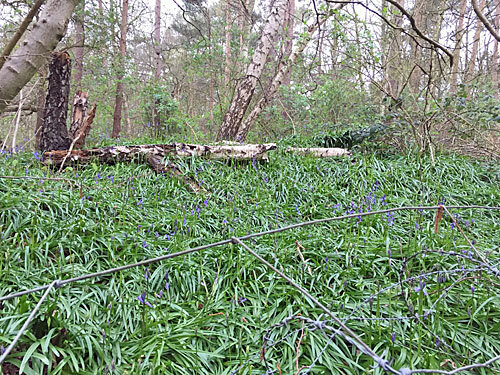 This month a burgeoning carpet of bluebells is spreading forth, in some places pushing through the barriers onto the path, but it would be inappropriate to step across the toppled barbed wire for a closer look. The chief reason not to trespass is that you might get shot. Ruxley Wood is home to the village's premier attraction for pre-pubescent youth, stag and hen parties - Combat Laser Games. 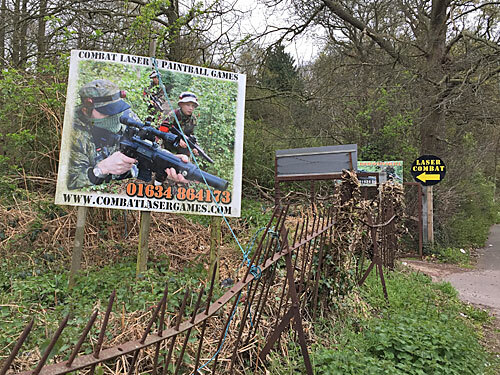 This epic hideaway offers paintball without the paint, preferring instead to shoot participants with lasers until the lights on their camouflage hat illuminate. A two-hour Hero's session costs £23, but for that you do get free cups of squash, unlimited shots and the chance to stomp threateningly through the bluebells. Younger customers evidently love it. For older visitors, horticulture triumphs. 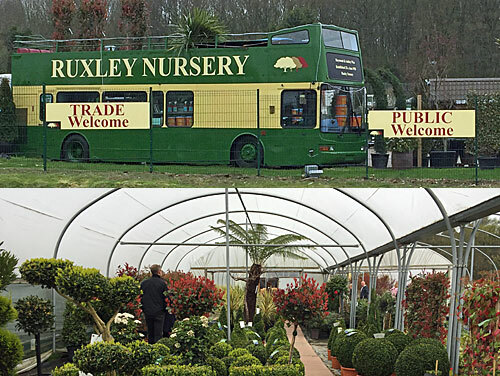 Ruxley Nursery shouts boldly from the roadside, courtesy of a strategically placed double decker bus. Its blind confirms the place was established by Raymond and Audrey Wise on 25th June 1958, and if you step inside you'll find a selection of vases, watering cans and other garden accoutrements. Over in the polytunnels are colourful acers, palms and cordylines, many Italian-sourced, while umpteen bags of compost are stacked beside the trellises. The overall vibe is as homely as a garden centre should be. But everyone's nextdoor, at Ruxley Manor. This 5th-generation family business isn't so much a garden centre as a Total Leisureware Nexus, as the scale of the hillside car park attests. Push through the turnstiles to enter a grand bazaar of frostproof pottery, ornamental roses and colour-coded perennials, and that's just for starters. 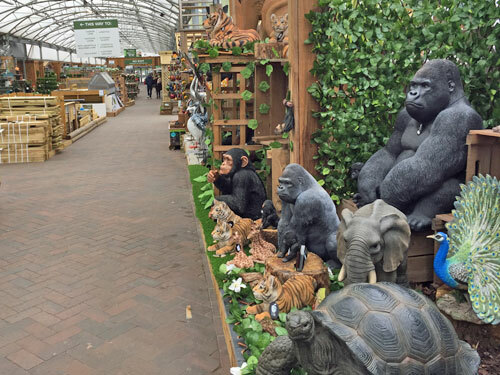 Within the main building are everything a Kentish couple might want to spend their surplus money on, including tanks of tropical fish, weatherproof cushions, fibreglass animals, turbo barbecue sets and humorous signs to hang on the door of your Man Cave. You probably have relatives who could spend hours here - I certainly do. Weary shoppers are invited to enjoy refreshment in the modern Mulberry Tree cafeteria (Chicken Fricasse £9.99) before exiting through the Food Hall. This freshly-opened bolthole is piled high with speciality treats that exceed your average farmers market, assuming your palate's not too spicy, plus a Butchers of Brogdale counter in the corner just before the tills. Other concessions on site include a hot tub specialist, a barber's shop for bored husbands and the rustic Coach House restaurant, which serves seafood and traditional Italian cuisine 1980s-style, much to any retired couple's delight. 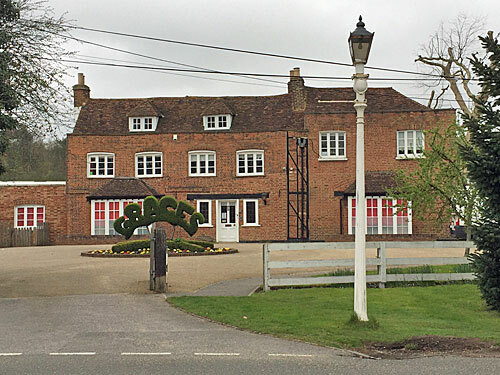 There is indeed a manor house at Ruxley Manor, of 17th century vintage with a 400-year-old mulberry outside, and is now used as a kindergarten. Its presence confirms that the garden centre is built across the village's historic heart, as becomes self-evident if you park your car near the uppermost trolley bay and investigate the 13th century building opposite. 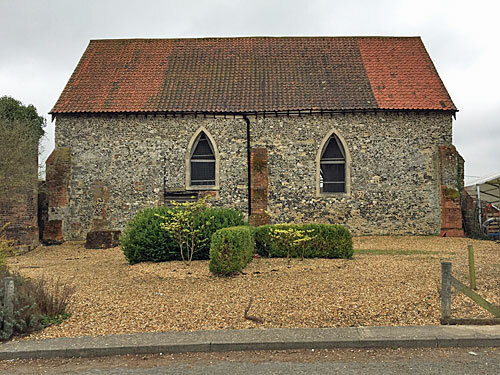 This was formerly St Botolph's Church, a simple aisleless building constructed of flint and stone rubble, but de-parished in 1557 and turned over for use as a barn. It's still used for storage, and retains an arched piscina and double sedilia, but unless you're a green-jacketed employee you'll not be going inside. If you were initially skeptical that Ruxley might be thronged with leisure opportunities and cultural gems, I trust you now think differently. Many's the family who make tracks here of a weekend to enjoy the garden centres, laser battlefield and varied dining opportunities, not to mention the twice-weekly boot sale on the farm I haven't had time to mention. Core entertainment values in outermost London are very different to the gimmicky world Time Out reports on, far closer to what the rest of the country enjoys, so add Ruxley to your bucket list for a truly traditional day out.